Here’s to the Winning Team! Home › Plaques › Here’s to the Winning Team! 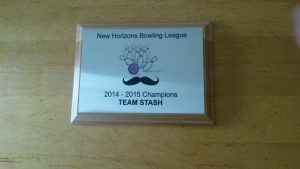 When New Horizons Bowling League finished their season, they wanted to recognize the winning team with a custom plaque. Congratulations Team Stash!